A Moment Connection in structural engineering is a joint that allows the transfer of bending moment forces between a column and beam (or any other two members). If a child member (a beam) has some internal moment, the connection should be able to transmit the load due to that moment. The objective of moment connections is to simulate as close as possible a fixed joint, denoted by the fixity code FFFFFF - meaning the connection is rigid in all translation and rotational directions. This is also the reason why moment connections are called rigid connections. While Shear Connections are dependent mostly on the web of a section, moment connections add to that by strengthening the connectivity of the flanges. This can be achieved through use of plate stiffeners, welds or other fixtures that strengthen and increase the rigidity of the connection between members. Moment Connections are normally more rigid and as such is able to withstand a much higher moment load than shear connections. However, as more material are used to erect the connection, it is significanlty more costly to use a moment connection as compared to a shear connection. Typically a structure would only have one or two unique moment connections to minise the cost. 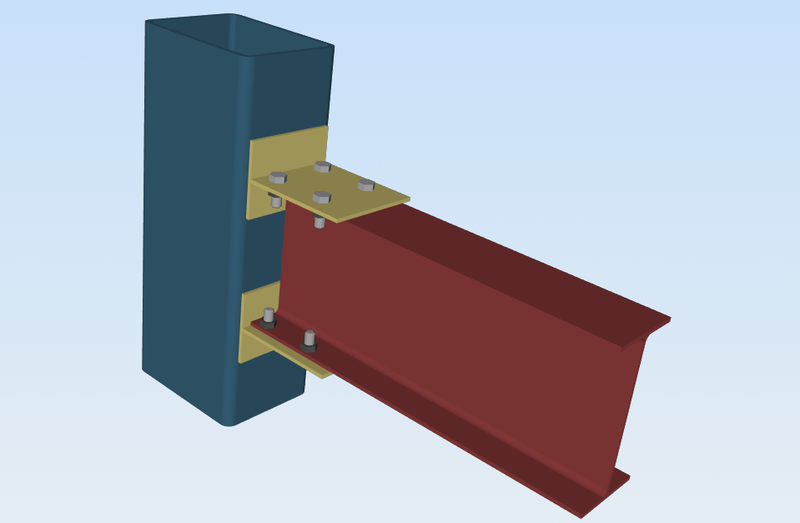 A Flange Plate Connection connects the flange of the column to the web of the beam member. A plate is either belted and/or welded to join the members to form a rigid fixture. An example of a flange plate connection can be seen from the adjacent image. This connection shows two yellow plates bolted to the flanges of the beam member to connect it to the column. As the beam undergoes bending, it will be passed onto the connected member. Through plates transfer moment between members through use of a rigid plate that is either bolted or welded to the members. The rendering above is an example of a Through Plate connection. If the HSS column undergoes a bending force, than intuitively it will transfer to the beam due to the yellow plate. Collared plates are fairly similar to through plates, however the plate does not extend through the HSS section. Rather the plate sits comfortably around the HSS section and then secured to the child (beam) members. Directly welding a connection in every direction creates a very strong, rigid connection. By welding a plate between the beam and column (welding around all edges) means that movement and rotation is completely restricted and a moment connection is formed. 3D Representation of a Moment Connection (Through Plate Connection) - the horizontal yellow plate causes the moment force to be transferred from the Hollow Section to the I-Beam (and vice versa), making this a Moment Connection. What's the difference between a Moment and Shear Connection? 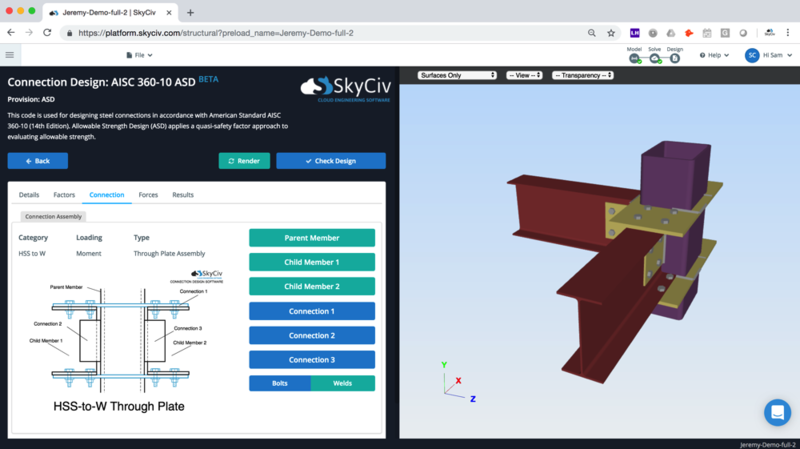 The above info, screenshots and 3D models of moment connections are from SkyCiv Steel Connection Design Software. The software will run design checks for the various design codes, includine AISC 360-10 ASD and LRFD. With full rendering, CAD export and drawings. The software will also produce a step-by-step guide of the connection shear design calculations so that you can follow the steps it is taking.